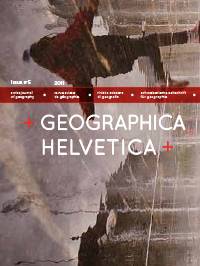 In 2012 Copernicus Publications took over the publication process of Geographica Helvetica (GH) with the aim of transforming this long-standing journal into a modern open-access journal. After a two-year transition period, GH is now fully open access. From now on, all articles will be available immediately after publication on the journals website. Previously published articles are freely accessible as well. All authors of GH articles retain copyright and the articles will be disseminated under the Creative Commons Attribution 3.0 License, also known as CC-BY. The articles will also be submitted to libraries and repositories worldwide and are preserved in long-term archives. Geographica Helvetica was founded in 1899 and is part of the cultural heritage of Switzerland. As the Swiss journal of geography, it publishes research articles in all fields of geography as well as in related disciplines. Go to the Geographica Helvetica website. More information on Creative Commons Attribution 3.0 License.